Workshop: Sing Your Heart Out! 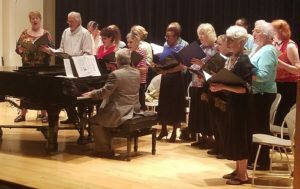 The popular choral program for adults 55+ returns for another 10 sessions of music under the direction of Robert Puleo, with a culminating performance for the public’s enjoyment on June 9th. To register for the workshop, please call the library’s Community Relations Office: (914) 813-3706. Ossie Davis Theater. Free. Made possible by the Lillian Roberts and Rick Englander Memorial Fund.